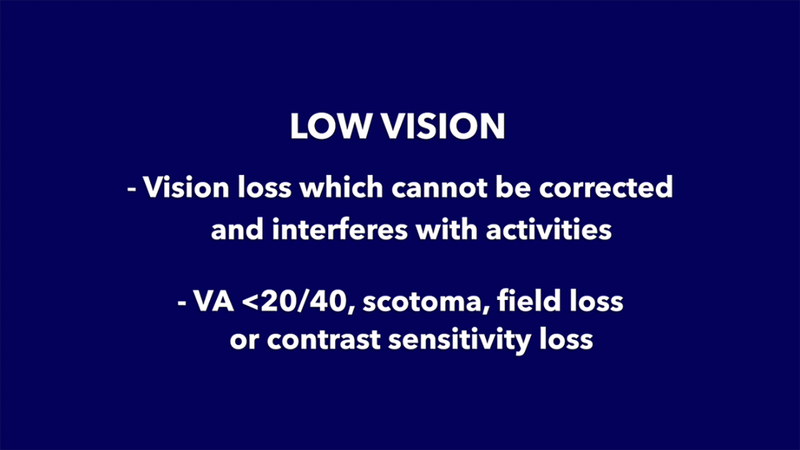 Referring low-vision patients (those with visual acuities less than 20/40 or scotomas, field loss or contrast loss) to vision rehabilitation services connects them with services that lessen the impact of their vision loss, and improves their independence and quality of life. Joseph Fontenot, MD, Chair of the Academy’s Vision Rehabilitation committee, led the production of the following six-minute video, titled “There is Something Else You Can Do.” Introduced by David W. Parke II, MD, Academy CEO, this video emphasizes the impact of vision loss on the individual and the responsibility of the ophthalmologist to refer or provide vision rehabilitation. With advances in technology, modern vision rehabilitation can help most patients with any degree of vision loss. Provision of, or referral to, vision rehabilitation is now the standard of care for all who experience vision loss. Click here for a transcript of the video, courtesy of the American Foundation of the Blind. Additional information, including handouts for patients, can be found below. This handout is for you to give to your patients with low vision. It provides essential tips for making the most of remaining vision and offers a list of resources where patients can locate local vision rehabilitation services using the "Help Near You" directory (if you do not have services or a referral system in place). Levels 1 & 2 (PDF 46K). Level 1 calls on all ophthalmologists to recognize patients with low vision and share a copy of the patient materials. Please instruct and encourage patients to read and act on it. Level 2 encourages all general ophthalmologists to add a few easy steps when examining patients. These steps are the four “R’s of Rehabilitation”: Record – Refract – Rx – Report. The Academy provides a Vision Rehabilitation Preferred Practice Pattern (PPP) Guideline. Ophthalmologists can also use this sample letter (Word 21K) to make PCPs aware of a patient’s vision loss and the possibility of Charles Bonnet Syndrome. Medicare reimburses for a low vision evaluation by an ophthalmologist or optometrist. If you have questions about the vision rehabilitation information on this page, contact the Academy via e-mail. The VisionAware ™ website provides information about living with vision loss, including home adaptations, products, blogs, and connections to local services. VisionConnectTM is an app which provides a searchable directory of services available in the US and Canada for children and adults who are blind or visually impaired. You can use the app to find local and national services and help for living with vision loss such as low vision services,computer and technology training, daily living skills training, dog guide training, employment services, braille and reading instruction, and more. Medicare and most insurers will reimburse for vision rehabilitation provide by Occupational Therapists. Ophthalmologists may refer visually impaired students in the United States to a program that will provide them with free access to the Spotlight Gateway reading application for iPads. Ophthalmologists should submit this form for eligible students. The Academy is participating in this program in collaboration with Lighthouse Guild, a nonprofit vision and health care organization, and Bookshare, the largest online library of books for people with print reading disabilities. For more background on the program, read the Academy’s news release and Lighthouse Guild’s information about Spotlight Gateway.